StockExplain - Trusted News and Interviews on Indian Stocks: Sanraa Media - Should Investors Buy India's Cheapest Stock? Sanraa Media - Should Investors Buy India's Cheapest Stock? After a dizzying free fall for around an year, BSE has placed India's cheapest stock by absolute price, Sanraa Media Limited (BSE: 531312) under a 5% circuit limit again, starting on March 11th 2011, that virtually prevent it from falling or rising from its CMP of Rs. 0.10, as long as this circuit is in place. However, investor interest in this counter remains high, thinking that this 'cheapest' stock of India can now be picked up near its all-time low. Sanraa Media had recently divulged that for raising cash, it is mulling to hive-off its animation division, which, unfortunately, is its mainstay business. Earlier, on February 1st, BSE had placed Sanraa Media on a 5% circuit limit, which stagnated the price at Rs. 0.13 for some weeks. But on recent expansion of the circuit to 10%, the scrip fell again, also creating a fresh 52-Week Low of Rs. 0.10. The case of Sanraa Media is a mysterious one, with quite an apparent divergence seen between recent core performance and recent stock performance. Between fiscals 2006 and 2010, Sanraa Media grew at a blistering pace, with sales growing at a compounded annual growth rate of over 150%, while profits grew at a CAGR of nearly 185% during the last three years of that same period. After a brief profit dip in the fourth quarter of last fiscal, Sanraa Media, formerly Sanraa Soft, had also rebounded with good QoQ profit growth in the first two quarters of the ongoing financial year, with profits more than doubling in Q2, sequentially. This Media & Entertainment company, but which officially falls into the capital market segment of 'Computers - Software - Medium / Small', and having its mainstay in the animation business, had closed FY'10 on a strong note with nearly Rs. 68 crore in income and over Rs. 8 crore in net profit. Still, by Q2 of this fiscal, Sanraa Media had still managed to better its performance with both operating profit margin and net profit margin nearly doubling from March 2010 levels. While OPM now stands at 41.66%, NPM is also at an impressive 21.80%. 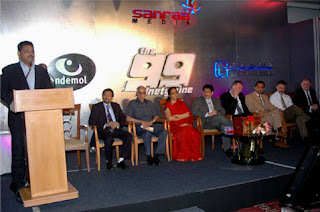 Sanraa Media seems to be a competent company in its core business of animation, with a few major international clients like Endemol of UK for which it did the internationally acclaimed animation series 'The 99'. According to self-estimates, Sanraa is also one among the Top-10 animation companies in India. However, the stark irony is that all this performance is now available at a market cap of just Rs. 11 crore, and still, no one - no company, promoter group, strategic investor, PE fund, or entrepreneur / businessman - seems to be interested in taking over the company which officially has only a 2.58% promoter group stake from the first quarter of last fiscal onwards. Theoretically at least, taking over this company with a 51% stake should be a Rs. 6 crore affair, something that easily falls in the realm of HNIs or even a group of organized investors. Practically speaking, however it might entail more than this due to accumulation diclosures, open offer etc., but then it should be remembered that much less than 51% is enough for effective control. But so far no entity has come forward for this Rs. 6 crore gamble. With the publishing of the Q3 share holding pattern recently, the official promoter holding has also become the practical promoter holding, as the SHP according to new norms had to divulge the promoter holdings in GDR too. Contrary to what long-term optimists at the Sanraa counter were hoping for, none of the underlying shares for the remaining 16.82% GDR is with the promoter group. However, thankfully, as with the September quarter, the December quarter also shows that none of the 2.58% promoter stake is now pledged or encumbered. For Sanraa Media, this is a far cry from June 2010 levels when over 42% of promoter stake was pledged, and from June 2009 levels when over 95% was encumbered. The scrip has been on a free fall from its early March 2010 high of Rs. 0.48, which is also its bonus-adjusted 52-Week High, and many investors have hurt themselves badly by catching this falling knife at various levels, with even multiple averaging at lower and lower levels unable to save them. Now Sanraa Media at Rs. 0.10, which is also its 52-Week Low, is BSE's (and India's) cheapest share if you look at only the price. However, Sanraa's adjusted all-time low is still lower at Rs. 0.05, though it is unlikely that Sanraa would slip to those levels, due to newer BSE restrictions. But interest for this stock among penny stock investors will remain even if Sanraa Media slips even further, which can appear to be nothing short of crazy for more seasoned investors and analysts. It would be worthwhile to investigate what is behind this kind of investor frenzy and whether it is justified in any way. One thing going for Sanraa might be that the stock has to its claim two stints in significant wealth creation in its 15 year old history. The first of these happened between 1997 and 2000, when its share price surged by nearly 66 times, from Rs. 1 to Rs. 66. An appreciation of one's investment to 6600% of the original value, that too within three years, was indeed impressive. The second wealth creation period offered by Sanraa Media for its investors was also impressive. From 2001 lows of Rs. 1.55, the stock soared to Rs. 131 levels by early 2008. It was an 85 times or 8500% increase within 7 years. If some retail investors continue to hope that this kind of performance can be repeated by the company and the markets in the future, they can't be blamed. But little do they realize that many things have fundamentally changed both inside and outside the company, making a third repeat performance quite difficult. If history is on Sanraa's side, so are valuations. Many retail investors are thrilled to see an investment opportunity like Sanraa Media, which is not only cheap by absolute price, but cheap by way of core valuations. Keeping in mind that Sanraa is an ongoing, profit-making entity with ambitious plans, its trailing twelve months (TTM) price-earnings multiple (P/E) of just 1.86 times comes across as a dream come true for many investors. Its peers in the industry segments of 'Computers - Software - Medium / Small' or 'Media & Entertainment' have an average P/E of over 26. Now, many cheap companies by P/E would be costly by price-to-book-value (P/BV). But not Sanraa Media. With a book value of Rs. 1.14, Sanraa's P/BV works out to just 0.11 times, which should be a sort of record discount to book-value among all listed companies in India. Being available at such steeply discounted valuations, at least a section of retail investors think that they can't go wrong with Sanraa. The downside seems so limited, while the upside seems limitless. For example, if Sanraa Media were to trade in the future at even half of its industry P/E of over 26, the target would be Rs. 0.93, which presents an appreciation to 7 times or 700% from current levels. But again, little do these investors realize that a valuation like P/E or P/BV is a double-edged sword. Though the primary purpose of these well-known multiples is to show how costly or cheap is a share at current prices, they are also about how a share is perceived or rated by the market. That is why front-line stocks in their sectors like TCS (BSE: 532540, NSE: TCS) or HDFC (BSE: 500010, NSE: HDFC) command above-industry-average P/E multiples, but are still considered as powerful growth stocks. In other words, a P/E somewhat below industry average or below that of comparable peers can be reliably looked upon as a safer attraction, but what happens if a P/E is one-third of the industry average? More often than not, it signals trouble. Now, the troubles signalled by a low P/E can be many. Too much of equity dilution can cause market to rate a share by poor P/E. Too much of free-float is also taken badly by the market. Without doubt, Sanraa stock suffers from both these factors. During the three years from FY'07 to FY'10, the equity base has grown at a CAGR of over 170%, which brought in significant dilution. And with only a tiny promoter holding, almost the entire market cap of around Rs. 15 crore exist as free float in the market, making the supply huge, and thus affecting the P/E drastically. The 1:1 bonus in 2008, the 10 to 1 split in 2009, and the 5:4 bonus in 2010, all appear to be steps that have helped neither the company nor its investors. For example, a Rs. 18 priced Sanraa Media share before the first bonus in 2008 has now become 25 shares worth a total of Rs. 3.25, which still amounts to a steep loss of 82% for the investors. A Rs. 1 lakh investment with Sanraa in December 2008 would stand decimated at just Rs. 18,000 today. Clearly, post December 2008, Sanraa stock has acted as a wealth destructor for its investors. But equity dilution and high free float might not be the only factors causing Sanraa's low valuations. Its TTM P/E is not one-third of the industry average, but one-fourteenth! Such deep discounted valuations often point to another kind of trouble. One example of such trouble is market's unwillingness to take such a company's financials at face value. Another example is perceived corporate governance or transparency issues. Another is anticipated poor consistency in future performance vis-a-vis competition. Still another is a diversification strategy perceived as bad by the market. Looking into whether such factors have affected Sanraa also in the recent past, we find that perceived transparency issues and strategic issues might be there. For example, in the year in which they successfully raised the Rs. 110 crore GDR, that is in FY'09, Sanraa Media made investments of Rs. 65.92 crore in certain undisclosed unlisted overseas companies. Considering that the company's annual income in that fiscal was less than Rs. 45 crore, and its net profit was less than Rs. 5.5 crore, this kind of hefty investments outside the company was difficult to explain. Since it was towards the end of that fiscal, no dividend was reported from that investment. But even after one year, that is in FY'10 also, no dividend seems to have been reported on account of that investment. Now, the question is not whether the Sanraa promoters acted on good faith or not, or whether these investments will indeed bear fruit in the coming years or vanish altogether. The point is that market is clearly not appreciative when a promoter group that holds less than 5% stake, goes in for an equity expansion of 4 times through GDR, and invests a sizeable amount in unquoted entities that cannot be easily verified by the investing public. Sanraa Media seems to have also suffered from strategic decisions that the market perceives as bad. For example, market doesn't take it lightly when an organization ventures into areas where it doesn't have core competence. Sanraa's diversification into distributing films and green energy ventures are two cases in point. On the other hand, in its core competence area of animation, Sanraa Media will be facing increasing competition from unlisted leaders like Toonz Animation, listed and diversified majors like UTV Software Communications (BSE: 532619, NSE: UTVSOF), resurgent players like Crest Animation Studios (BSE: 526785, NSE: CRESTANI), an impressively diversified player like Prime Focus (BSE: 532748, NSE: PFOCUS), and deep-pocketed but relatively new entrants like Reliance MediaWorks (BSE: 532399, NSE: RELMEDIA) and Tata Elxsi (BSE: 500408, NSE: TATAELXSI). Almost all of them stand a notch above Sanraa Media when it comes to working for multiple mainstream Hollywood labels. However, except for the powerfully diversified players, the market expectation is that none of them including Sanraa will return to enjoy the kind of exuberant valuations during past bull runs. The reasons include a more sober understanding of the animation business, increased competition, and the continuing lacklustre demand and margins in their domestic operations. This plight of animation companies is somewhat similar to the rating problem now faced by listed brokerages, compared with the past. Coming to the question of whether investors should consider Sanraa Media stock at these levels, the answer remains what should have been the logical answer throughout this free fall that lasted around 1 year - it is better to wait. The only risk from this strategy is that perhaps you wouldn't get Sanraa Media at its cheapest, but if it is really going to turnaround and outperform, this shouldn't matter much, as there will be enough attractive buying opportunities later. Better is to wait for fundamentally positive signals from the company like abundant orders, consistent growth, an end to the dilution culture, promoters upping their stake through buyback / open offer, and better transparency in issues like overseas investments. However, such fundamental signals should also be complemented by strong price action with volumes. It is better to keep an eye on these technicals too. On a strong sustained growth in EPS, and better investor friendliness, Sanraa Media can travel to the P/E valuations of a comparable player like Crest Animation, which will translate to a price target of Rs. 1.75. On the downside, investors would be better off if they keep in mind that Sanraa Media is currently trading as a penny stock, and like all penny stocks, carries significant risks that can go even up to losing their entire investment due to further price fall, further dilution, or even suspension or de-listing by BSE. Sanraa Media's continued status as a B Group scrip is prompting many retail investors to trade it for the short-term, but it is better to remember that around 70% of Sanraa Media shares, are held by thousands of large retail investors who hold at least a minimum of 1 lakh Sanraa shares each. Such large investors can offload huge quantities at will, and smaller investors will often be caught off-guard. StockAsk..We all appreciate ur Excellent Views & Analysis.